The great shrine at Izumo, Izumo, taisha hotohoto no zu from Rokujuyoshu meisho zue, “Famous Views in the Sixty-odd Provinces.” The set published by Koshimuraya Heisuke, 1853-6 (this being 1854). 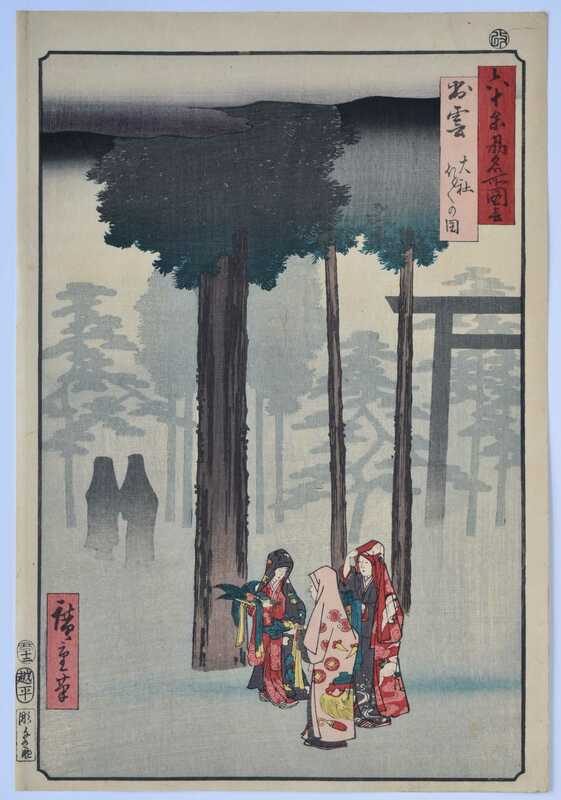 Shows a group of three young women bringing offerings to the Shinto shrine. 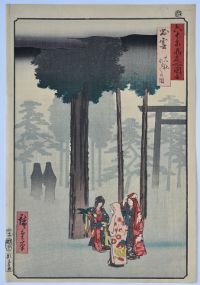 A large cryptomeria tree in the foreground and other figures, trees and a torii in the misty background. The main deity of the shrine is Okuninushi no Okami, patron of good relationships and marriage (which probably accounts for the women’s visit). A beautiful design when well printed. Fine early impression: Should have applied bokashi across the foreground area, as here. Fine colour. Slight vertical crease in left margin, otherwise fine condition. Signed Hiroshige hitsu.